No job is too big for the 2017 Ford Super Duty. After a complete redesign, this truck is ready for the challenges of modern life. It comes in 15 hard-working models, with plenty of available features to enhance utility and comfort. Advanced technologies, fuel-efficient powertrains and other designs make this a truck you can be proud to drive. You get to choose between two engine options for the 2017 Super Duty lineup. The first is a 6.2-litre Flex-Fuel, gasoline-powered V-8. It overpowers other gasoline engines on the market with a peak 430 lb.-ft. of torque. Power delivery comes quickly, so press on the pedal and feel an instant surge. A new TorqShift G 6-speed automatic transmission runs smoothly and quietly, even under heavy loads. For even more capability, choose the 6.7-litre Power Stroke turbo diesel. It puts out 440 horsepower, plus 925 lb.-ft. of torque, so you can really take on big jobs with extreme confidence. This is made possible by the unique layout, which includes a graphite iron engine block, an exhaust manifold in an onboard position and the turbocharger situated in between the cylinder heads. It works with a TorqShift SelectShift 6-speed automatic transmission for unrivaled performance and dependability. 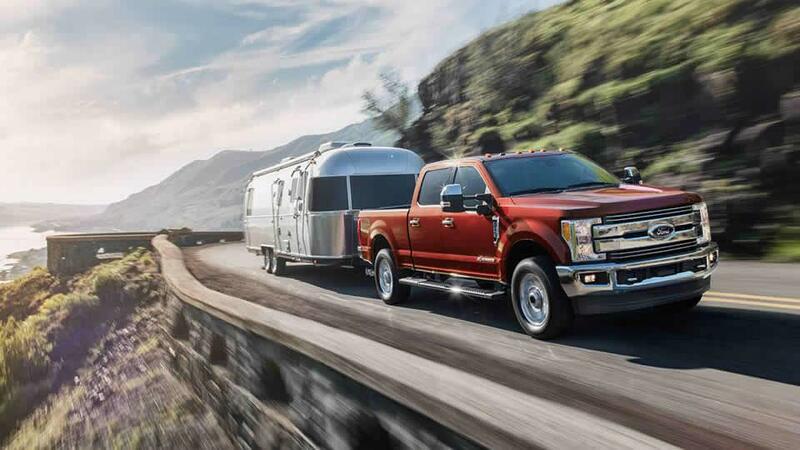 Just as important, you get incredible capabilities with the 2017 Super Duty. Conventional towing capacity is amazing at 21,000 lbs. (9,525 kg). This is made possible not just by the strong powertrain, but also the rugged, fully boxed, high-strength steel frame. Suspension, axle, and driveline components are also designed to handle that kind of extreme weight without problems. If you need to haul, the Super Duty excels in that area as well. Thanks to the new design shedding 350 lbs. of curb weight, and a frame that's 24 times stiffer, the truck can handle loads up to 7,630 lbs. The BoxLink System allows for using all kinds of aftermarket accessories in the bed. With an available centre high-mounted stop lamp with an integrated camera, drivers can check on loads without turning around. Plenty of new, innovative technologies are included or available for the Super Duty, boosting functionality dramatically. For example, the standard adaptive steering system changes sensitive according to vehicle speed, so you can turn with greater ease at low speeds. It also adds stability when traveling on the highway. A blind spot information system is available, warning the driver if another vehicle is hidden from view in the next lane. This technology covers not only the truck, but also any trailer you might be towing. With the included cross-traffic alert, a warning is triggered if another vehicle approaches from the side while you're backing up. With Sync 3, you get the latest hardware and software, plus simple menus and swipe capability for the colour touchscreen. Advanced voice controls let you speak naturally, while navigation, Siri integration and automatic updates through WiFi are also part of the upgrade. Learn even more about this incredibly capable truck by paying us a visit today.